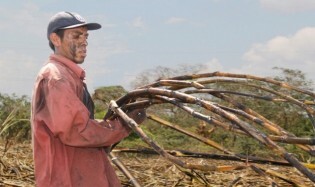 The participation of children and teenagers in the sugar cane harvest, a dangerous agricultural activity, will soon be a thing of the past in El Salvador, where the practice drew international attention 10 years ago. Newly Recognised Indigenous Rights a Dead Letter? Nearly three years after the rights of El Salvador’s indigenous people were recognised in the constitution, there are still no public policies and laws to translate that historic achievement into reality. Amanda Menjívar is moved by the sight of the 16 sewing machines donated to help a group of local women set up a sewing centre to get over the devastating effects of the disaster caused by Hurricane Ida in the Salvadoran town of Verapaz. Persecution of trade unionists remains a problem in El Salvador, in spite of the fact that the country is governed by a left-wing party that advocates labour rights, union leaders say. María Elena Muñoz industriously weeds a clearing in the forest and then digs several holes, where she and another four dozen women are planting plantain seedlings, to help feed their families in this poor farming area in El Salvador.